There are going to be three lighting zones: The main tenkey area, the two rows to the top and left, and a WASD-style gamer section over 8-4-5-6. There are going to be three lighting modes: Static, breathing, and reactive. The backlights will be dimmable in static mode. The backlights can be turned off. I've been tossing around an idea to make myself something like this. 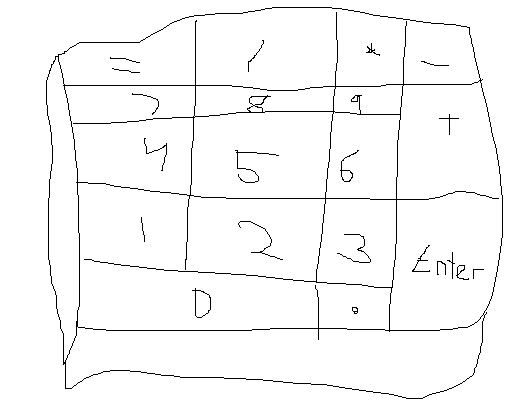 It's a separate 10 key with some extra keys to allow it to stand alone for number crunching or gaming. Do YOU have what it takes to design a proper case for it? You will be paid in PCBs. Did this quickly. All files can be found here : https://www.dropbox.com/sh/py9bj0z5ow459dd/4JjRfulnYP feel free to use, edit any of them. I haven't added any kind of screw holes, places for usb. If you like the design and want me to go further then I will. I like it Looks solid as a rock. Reminds me of KMAC2 which is a good thing indeed. So, would it tap into the top and screw in from the base? Also I think we'd need the plate to screw to the base. I have not thought about where the USB would go, totally spaced out on that one, heh. I'll have to get on that. 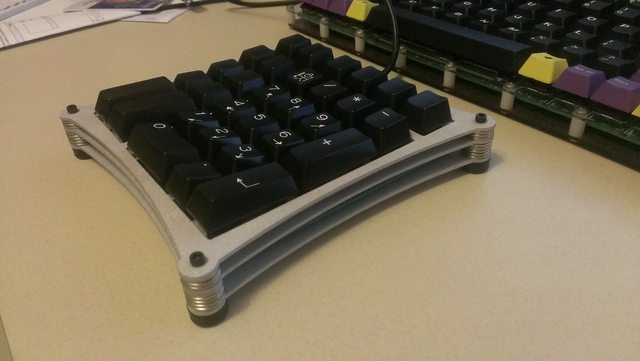 I think the manner that you described it is how Photekq's TKL case is setup as well. Yeah. It's hefty. The base is about 10mm thick. Screws would tap into the top from the base like you described, and here's the plate mounting. M3 tapped holes in the base, 3mm laser cut holes in the plate. Gaps for the screwheads will have to be added into the top but I haven't got around to it. I'll put some work into it later/tomorrow. Definitely no rush at all. Plenty of developing to do. Added screwholes. They go in from the base, and then near the end of the base the holes become smaller, threaded m3 holes and continue up into the top. This is really nice, Photekq. Love it! How do i make one? How do the sides attach to each other? How does the bottom attach to the sides? Are they all one piece? What are you designing it to be built out of? Looks very neat & I'd love to make one Let me know! Damn, Photekq, you already seduced me with your TKL, now this? Seriously. This looks great, and I hope this goes to market! We're coming along pretty good. I'm slowly working on the layout and whatnot. I'm thinking it should be full LED, yes/no? Photekq, I have some suggestions about the basic concepts. I really think the case should support the entire back of the PCB. I am a big fan of adding a pad behind the PCB which would be impossible with your design. It really helps to absorb vibration, because there are no supports from standoffs in the middle of the matrix. Again, take the KMAC as an example, it's how they do it. Check out this crude drawing to illustrate what I mean. Note the screws are perpendicular to the top face, not the bottom face. Wouldn't that be a more appropriate attachment for the two halves? I see what you mean. 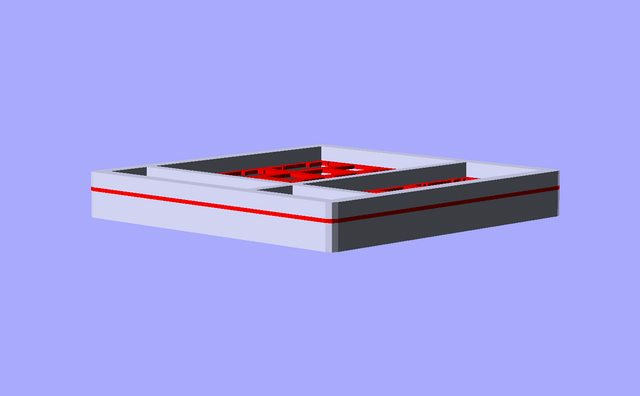 So you want the hole in the bottom half to be shallow and to be angled so that the pcb is parallel to the base and can come in contact with padding. Is the picture attached ok? How deep should the hole be from the surface of the plate? According the Cherry's specsheet it's about 8.5mm between the surface of the plate and the bottom of the switch pins.. How much extra do you want to allow for padding? 10mm deep sounds good to me. Also, I think the screwholes should stay vertical. If they were at an angle they would take up more horizontal room. This would mean you'd have to make the front an back faces thicker which, imo, makes the case look worse. It's up to you though. Having them at an angle wouldn't stop it from functioning. I can get you exact measurements. Hey what should we use for incline angle? Is there a standard for that? I don't think there's really a standard.. Filco is about 5.5 degrees without the feet up. I have it as 6 degrees on this case and on my tkl case. Interesting. I wonder what the Cherry boards are. Also, I think the screwholes should stay vertical. If they were at an angle they would take up more horizontal room. This would mean you'd have to make the front an back faces thicker which, imo, makes the case look worse. I'm confused by this statement. By my understanding, the opposite would be true. By having the screw holes not be parallel to the exterior walls, they need more material to live in. The 'vertical' screw holes come very close to the cavity. We may need an(other) engineer to weigh in. The front face and the guts (keys, pcb) are oriented together, so I like to think of that as the 'flat' side. What I'm saying is that they take up more space horizontally. See the diagram I've attached. The problem is that in order to make the angled holes work you'd need to make either the front or side walls of the case thicker. I may be wrong, but this is the way I see it. Maybe CPTBadAss would be able to help. What I'm saying is that they take up more space horizontally. Yeah, that was kind of what i was getting at; the devil is in the details. Or in this case, the corners. How will the sides attach to each other & how does the bottom attach to the sides? How do I make one? - Design one in a CAD program and then pay to get it CNC machined. How do the sides attach to each other? How does the bottom attach to the sides? Are they all one piece? - They don't, they don't and yes. There are three parts. The base, the plate and the top. Each are machined out of a solid block of material. The plate screws onto the base, and the top screws onto the base. The PCB is attached to the plate. What are you designing it to be built out of? - It's up to metalliqaz. I'm guessing he'll pick aluminium. Thanks. 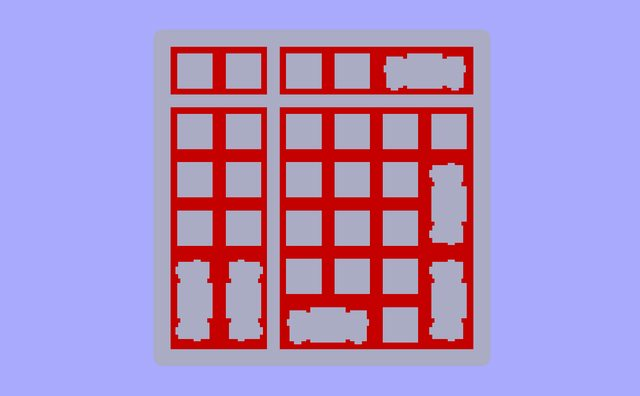 I have a CNC mill, thank you, and I've been working on breaking your model into g-code. FYI, a workpiece is greatly simplified if you don't have to work both faces -- i.e., the screwholes on the bottom. IIUC, the base has a smooth slope upwards; non 90* angles require additional finishing because of how CNC machines have to cut sloping surfaces. Additionally, cutting holes for USB in the side will require remounting the piece sideways -- or the shop having a 5-axis mill, which ain't cheap. It seems like it might cost rather a lot this way. I'll be curious to hear what kind of quotes metalliqaz gets. The problem is more like bearcat said. You have to have tooling to hold the parts in and moving/rotating/swapping parts is going to be an issue. I would keep the holes inclined because otherwise, the screws won't sit flush if we're bolting from the top down (from the top, into the plate, into the base). Adding a additional hole (or two) in the center for mounting the plate to the bottom part should help with this! I like your design, metalliqaz. It might also be useful for a programmer who often has to do with hex numbers. Although, for this purpose an 'x' key might me useful. Me too. It sticks in my mind. I'm going back to the design phase, though, to make it full-LED. Interesting project, something along the lines of the GHPad TFR and I are working on! I like how you have those four cluster. Interesting, very interesting. Got a first draft of the thing with full LED support. Looks like it will come together just fine. I've designed it with two indicator LEDs and three backlight zones. I think it gives plenty of utility as well as bling-factor. Dat QazPad. It's looking great man! Okay so after all this time I still want one of these. I'm going get it fabbed. Before I do, I am offering to let anyone buy a prototype who wants one. This will help absorb the tooling cost. Full disclosure: if you go for it, you are taking a risk. This is prototype. If there is a fatal design flaw I will only be able to manage a partial refund. This isn't my first time out, though. Voice interest here and I will try to come up with cost. I'm going to make two for myself, no matter what. I'm sure there's someone around here who could whip up a case for it. 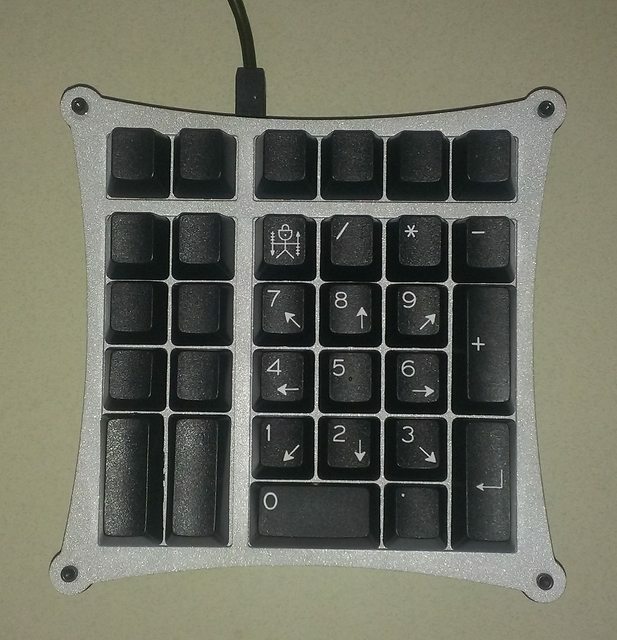 It is a 31 key pad with full backlighting and can use Cherry MX plate mount or PCB mount switches/stabilizers. I will provide software but it could also use TMK if you wish. I'm in for a prototype. Please make this from machined aluminum. I'd be in for proto and can make the case if you decide on acrylic. Can you give a frame of reference for cost? Will it be programmable? I'd want media and macro keys in a small form factor. I'd be interested in a PCB/controller, possibly a plate... but I know those aluminum cases seem to turn thirty-dollar PCB based projects into excursions costing slightly less than a new Ford Fiesta. 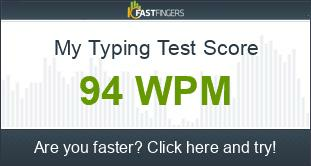 It is fully programmable with a keymapping tool. 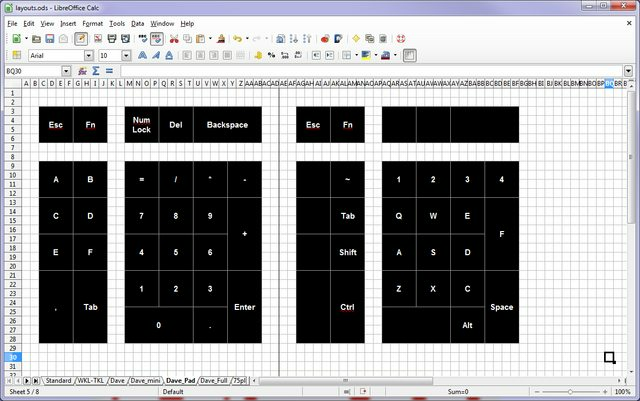 Media keys, mouse keys, macros and ten layers. 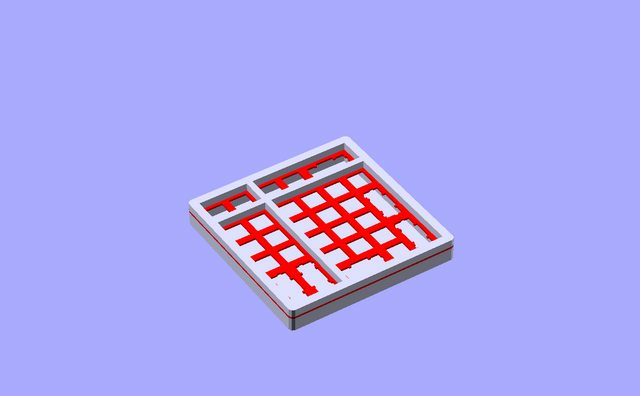 My intention was to only make the PCB and let anyone make their own plate/case. PCBs will be 10 bucks or less, but all the components will bump it up perhaps another 10. As I've said from the first time I saw this in IRC, I think this is a really cool idea. It's a gamepad a la Orbweaver, and it's a functional numpad, too! 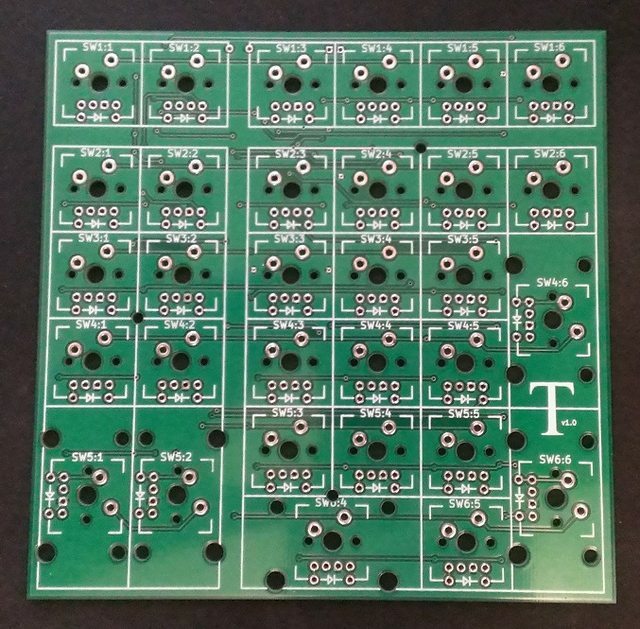 $10 PCB? I'd definitely be in for one or two. It would make for a fun little project and it would be fun to fab a case for it. 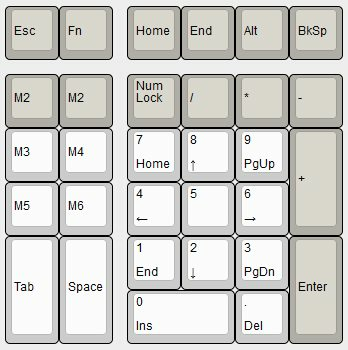 Okay so before I finalize this board, what is the best placement of the LED for the 2x vertical keys? Looks like the Ducky Shine puts the LEDs on the left. That's what I did in the current design. Any other opinions?